I have a little Pentium box running Windows 95 with built in Ethernet, connected to my network. It only has a 3 1/2 inch drive and no CD-ROM, so getting larger software on it is a pain. The IDE bus accepts only one drive and the sole ISA slot is occupied by a sound card. It is connected to the internet and It has Internet Explorer 2 but that software is pretty much incapable of opening any website whatsoever. I'd like to transfer files to it somehow, be it over LAN from my modern Windows 10 machine or over the internet. Any help would be appropriated. Make sure that on your Windows 95 and modern Windows 10 machines have the same usernames and passwords. Also, on Windows 10, it'll have a hard time contacting the Windows 95 machine for some odd reason. 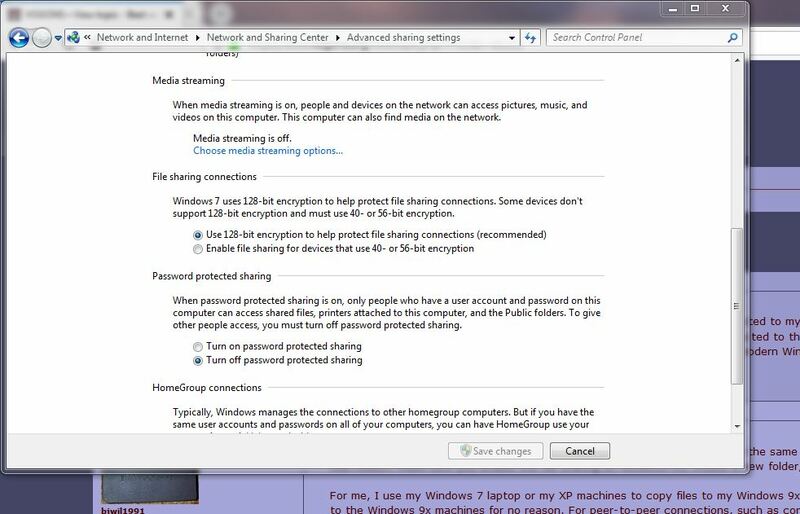 Make sure you enable the file sharing on Windows 95, create a new folder, and share it as full access. For me, I use my Windows 7 laptop or my XP machines to copy files to my Windows 9x machines that are on the network at home, or my Windows 10 desktop as my Windows 10 laptop refuses to connect to the Windows 9x machines for no reason. For peer-to-peer connections, such as connecting the Windows 95 machine to the Windows 10 machine, you would need either a crossover cable or a switch to hook up the machines and setup the Windows 10 machine with an IP address and Windows 95 with the IP address and the gateway with the IP address from the Windows 10 machine. Just use FTP, it has worked for nearly 40 years. Didn't think of that. Good idea for using FTP. I might set up a NAS system sometime with FTP so I can copy files to the server and copy from the server to the client machine. Yeah, just use FTP.. Or punch cards. There is no need of FTP. I connect all my machine from 286 upwards and macs from lc475 upwards to my NAS in order to transfer files. You see I can transfer to nearly every machine on my setup with this little beast. One thing does indeed not work, because of the small cpu and small lan power. I can not use it to create floppys for my older retro-machines with the software from bu22. It's far too slow to browse through the game-disks with the screenshots. Using a hosted website on my NAS is also way too slow for that purpose. Last edited by dr.zeissler on 2019-4-03 @ 15:23, edited 2 times in total. IDE to Compact Flash is also an option.. I also sue FTP. That or CD-R and flash drives. One interesting thing to point out. I use an old firmware for my NAS because synology changed the lanman to only accept passwords to be sent crypted. If I upgrade to the newer firmware I can no longer connect via lanman and tcpip. In that case and perhaps with a newer OS like Win7, I think then you are better with a ftp program. If you come across this screen ("No permission to access resource") upon writing from Win9x to another ressource, you can try to install the NTLM 2 authentication for Windows 9x/NT (DSclient.exe). A USB PCI card might be an option. You could use XUSBSUPP to get the USB mass storage drivers on Windows 95. Alternatively, yes, an FTP server is great. Or - if you want to use MS-compatible network shares, I know that modern Linux with Samba can create and use Win9x-compatible shares, but modern MacOS or Windows 10 has trouble. This is exactly what I do. I find it to be especially ideal with Win 95/98 machines using something like a 3Com 3C509 network card which doesn't require any additional drivers after a base Windows install. This allows me to immediately mount the Samba drive in Win 95/98 to grab the rest of the drivers and software I want to install, no mucking about with any configs or USB, CDs, CF cards, etc, etc. I didn't even consider FTP!! Also works fine & very easily under dos, look for the mTCP suite. Even something as old as an XT (or indeed PC Jr ) will happily share files with your server. I usually transfer files by using a webserver. The directory listings in most webservers are still 90's browser friendly. ^Webservers are apparently very easy to implement. I wouldn't be surprised if someone will made one for the i4040 someday. I think I needed to set the enable 40/56 bit encryption option to get it to work between Win 7 and 9x. Yes, you're right - that's one important part of it. I hope boratintheuk gets it working and wish him good luck! If not, he can try the the other solutions the other nice Vogons users mentioned before. In either case, let's don't desperate. We're are / he is not lone with that issue. Lot's of people have and had it before. (WfW 3.11, Win 2k etc) with networking & folder sharing enabled. This will act as a bridge between old an new. Or simple get an old or cheap Raspberry Pi and let it be the server for the vintage network. Since it usually is Linux or RISC OS based, there are less security issues, too. Edit: Small edits. Sorry, I'm a bit sleepy, hah. Edit: Here's a link to an issue (#80) of Raspberry PI magazine. On Page 44, there's a tutorial that teaches how to build a Samba/CIFS file server..
Last edited by Jo22 on 2019-4-11 @ 05:27, edited 1 time in total.